This time it is our photo challenge. This photo just spoke texture and frills to me and I wanted to make something that was way out of my comfort zone. So out came the lace, doilies and a pretty embossing plate. The sentiment here is from Verve and the tag from CAS-ual Fridays. I used a scrap of water colour card to cut the tag and stamp the sentiment. This card was made especially for teamie and friend Shauna for her Birthday. She often uses ribbons and texture on her cards....although recently I have noticed more water colouring and CAS designs sneaking in. Basically she is very creative and can make cards of all styles. I wanted to try to make something for her that was different than my normal style. Actually in the end I was happy with how it turned out. 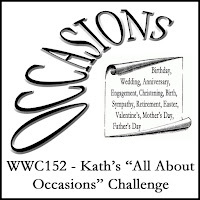 Our Guest Designer for this challenge is the talented Charlotte-check out her blog here. It is full of amazing projects. Then pop over to Inkspirational and see what the DT have created using this photo as their inspiration. Great way to go out your comfortzone this way! Love the background of the tag and thelight ribbon is such a great extra texture! Enjoy the weekend! I am sure Shauna will love this Sandie. So soft and feminine! Away from the comfort zone! And you smashed it! Gorgeous card for our sweet Shauna, Sandie! Love that you've incorporated elements of her style into your design! The colours and texture...swoon! Great take on the sketch Sandie, and terrific you were able to make something out of that comfort zone. Your background is beautifully embossed and I like the way you used the doily to offset your tag. Thanks so much for joining us this week and sharing your creation at the Watercooler Wednesday challenge. Hi Sandie, what a lovely card. It's hard to create outside one's comfort zone but you certainly managed beautifully. Love that subtle embossing and the lovely doily. Great colours. Thanks so much for joining our Watercooler Wednesday Challenge this week. Lovely card, Sandie! Thanks for joining us at the Watercooler Wednesday Challenge. 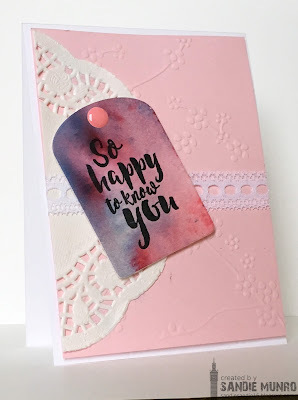 Oh, I love your little frills and watercolor tag! I remember making it my mission one year to figure out how to do shabby chic. It was SOOOOOOOOOO out of my comfort zone back then. Now it comes pretty naturally, like slipping on a favorite sweatshirt! :) So glad you stepped out of your zone and enjoyed the process. Lovely card! Thanks for joining us at Watercooler Wednesday! This is so pretty! I love all the little detail you included in this! Nicely done! Thanks for joining us this week at Watercooler Wednesday! This is so sweet and feminine, Sandie! 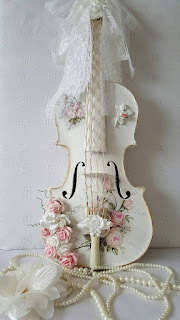 Love the embossing and the doily!